How to deliver the “three Cs” of investigator meetings—compliance, consistency, and cost-effectiveness. Among the most unique and important meetings for pharmaceutical and life sciences companies are the investigator meetings that bring together healthcare professionals for training on how to participate in the clinical trials that will move their drugs and devices forward. These critical meetings are a key focus for Heidi Cocca, meeting manager at Merck, who works with the meeting management team to deliver what she calls the “three Cs” of investigator meetings. 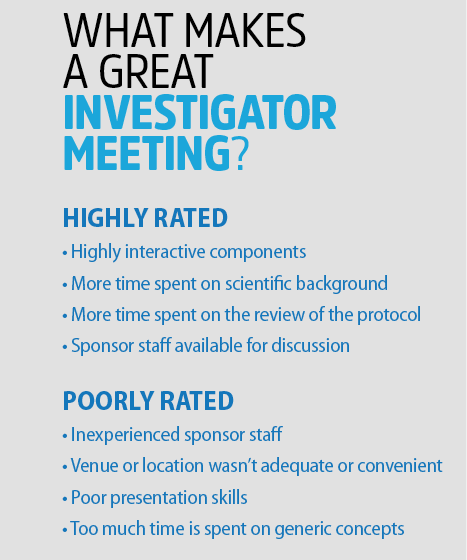 She shared her approach to compliant, consistent, and cost-effective investigator meetings with the audience at the 2017 Pharma Forum conference, along with some advice for making these meetings as effective as possible. • Country requirements: Investigator meetings must adhere to the policies of the HCP’s home country, which typically includes a certain meal cap and sometimes rules on what class of airline seat and hotel star rating is allowed. • Pharma compliance: conforming with International Council for Harmonisation of Technical Requirements for Pharmaceuticals for Human Use, or ICH, guidelines and transparency reporting. Consistency. Again there are multiple layers to be considered, says Cocca. First, investigator meetings need to be internally consistent. “We want to make sure that if you are an investigator from South Carolina, you walk away with the same knowledge and experience as an investigator from the Ukraine,” she said. Second, they need to be in line with the norms of the pharma industry so that HCPs don’t perceive your investigator meetings as an outlier in terms of meals, accommodations, or payments. Cost Effectiveness. Cocca stressed that her focus is not on pinching pennies but on spending money in a way that is responsible and meets the goals of building relationships with HCPs and training them effectively. While cost saving is important, she said, there are costs to an unengaged HCP, including the expense and time of needed for retraining and the time lost for the trial itself. The effectiveness of the investigator meetings is also a matter of meeting design. “A multi-center trial demands an engaging, well-thought-out investigator meeting to train and motivate personnel, and provide investigative sites with solutions to problems that may arise,” explains Cocca, who shared three strategies for building engagement from the start that will lead to a return on your investment. Learning Styles. Educational retention rates are far higher when information is presented in all three learning modes: visual (videos, flip charts pictures), auditory (speakers, podcasts), and kinesthetic (role playing, practice, demonstrations). “Having heard something is not as good as having seen it. Having seen it is not as good as knowing it, and knowing it is not as good as putting it into practice,” said Cocca, who encouraged the audience to think creatively about how they’re delivering content. Hone Your Content. With a pre-quiz or a pre-survey, you can unearth valuable insights into what your audience knows—and what it doesn’t. Armed with that knowledge, you can customize your education to ensure that they leave the meeting trained to be as effective as possible in your trial. Encourage Interaction. “The thing that I love the most about any sort of gamification in investigator meetings is how much the attendees get into it,” says Cocca. Whether it’s role-playing or games like Jeopardy or Family Feud, the HCPs she works with enjoy learning the protocol through competition. “It’s the competitive nature of us.” But most important, she notes, are the outcomes. It’s not just getting them energized; it’s checking their knowledge and reinforcing the learning. “The key is not playing a game for the sake of playing a game,” Cocca says, and that goes for other engagement activities like audience polling or interactive iPads for taking notes. 2019 Pharma Forum Trailblazer Awards: You Could Nominate the Winner!